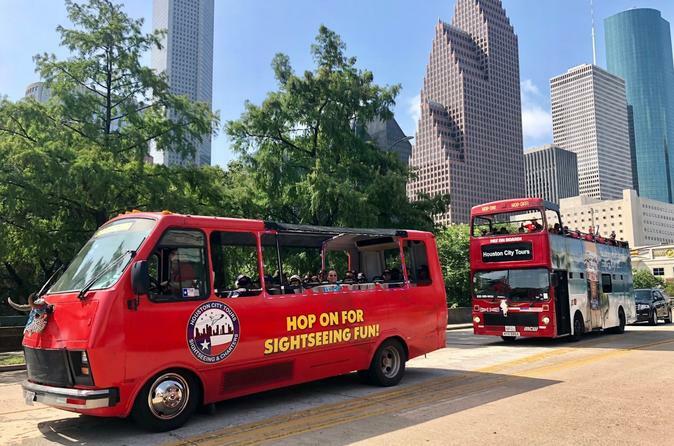 From the HCT Visitors Center, explore Houston on a 75-minute loop hop-on Houston sightseeing tour, which travels by double-decker bus to six stops around the city including Convention center, Minute Maid Park, Historic District & Market Square, Downtown Aquarium, Houston Heritage Society park, financial district, Midtown and more. Enjoy unobstructed views of breathtaking architecture and live onboard commentary, and simply hop off at any of the six stops to sightsee in depth. Experience Houston's most noteworthy attractions, sights and shopping areas at your own pace with this convenient Houston city tour. Alternate vehicles may be used according to number of passengers, weather or traffic conditions. Board the open-top, double-decker bus at the amazing Cowboy themed Visitors center . Listen to entertaining and informative live commentary from your onboard guide as you relax during the full ride, which takes about 75 minutes, or hop off the bus to walk around and sightsee in depth at any stop along the route. Around the Convention Center, your bus passes by Minute Maid Park, home to the Houston Astros baseball team. Nearby you see Market Square Park, a historic square surrounded by 19th century buildings and home to a growing number of restaurants and entertainment venues. If you explore on foot, you can visit the JPMorgan Chase Tower's observation deck, which is perched on the 60th floor with great views over the city. The tower boasts a number of records, including tallest building in Texas and the world’s tallest 5-sided building. Here you can also pop into the Houston tunnel system, a network of climate-controlled walkways located 20 feet (6 meters) below ground, which connects 95 city blocks. Walking around Houston’s stately City Hall, you can stop at Tranquility Park and the Houston Heritage Society, a complex of ten historic structures at Sam Houston Park. Look at the historic homes in more detail or stroll around the pretty grounds. The theater district spreads across a 17-block area nearby and features nine world-class performing arts venues. Whatever your interests, this Houston city tour offers plenty to discover. See the Itinerary section below for a list of all stops.